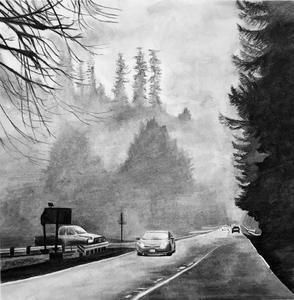 The art of 31 La Salle students was recently selected to be published in a hardback anthology featuring student works from all over Oregon and the U.S. The students' work was selected for the book through Celebrating Art, a Utah-based company that holds a student art contest three times a year. About 25% of those who entered the Fall 2018 competition were invited to be in the book. "Our philosophy in judging entries is to be selective so that it is an honor to be published, but not so exclusive that it is discouraging to enter the contest," Celebrating Art says on its website. Of all the Oregon schools that entered the most recent contest last fall, La Salle had the most student works selected for the book, earning it a “Contest Star” designation. And because so many La Salle students have been selected for Celebrating Art books over the years, La Salle is now ranked second in Celebrating Art's Oregon “All-Time Stars” list. The Fall 2018 book will be released in April. "The art students at La Salle are creating really high-quality work, often college-level work," said art teacher Cha Asokan. "Having your work published as an artist is very exciting, especially when some of our students are aiming for careers and degrees in the creative industries. I am so proud of our artists!" To get an idea of what the Fall 2018 Celebrating Art book will look like, swing by La Salle's front office this week. There you'll find the Summer 2018 edition of the book, which also features the work of several La Salle artists. Image: A charcoal work by Victoria Azar '21, which was selected for the Fall 2018 edition of "Celebrating Art."